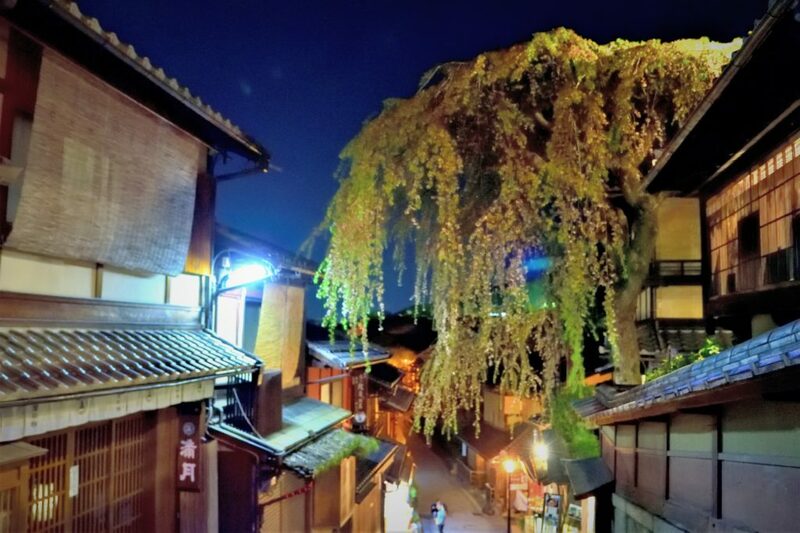 "Ninenzaka" and "Minisaka" were created as a worship route leading to Kiyomizu Temple. It is a spot where you can enjoy Kyoto's best emotionally beautiful scenery, with tiled roof Japanese houses lined with cobbled streets. From Kiyomizu Temple on the way down Kiyomizu-zaka on the way to Kodaiji area, there are many attractive shops such as famous shops, old-fashioned restaurants and popular souvenir shops in the approach. It may not be known unexpectedly, but the official names of Ninenzaka and Sannenzaka are Niningzaka and Sannyeongzaka, respectively. It is the theory that the name was given to the origin of Sanseizaka because Toyotomi Hideyoshi's regular wife "Nene" who had been living in Kodaiji Temple went up the slope and went to Kiyomizu-dera in anticipation of the birth of a child There is. It is said that Niningzaka and Ichimenzaka were attached to each other below. The legend "I will die within 2 years if I stumble on Biennial slope" and "I die within 3 years if to stumble over Sanage slope" is said to have been told and told that "I will take care of Ishi Danzaka" It is considered. The stairs of the cobbled floor are a bit steep, so be careful with your feet when coming wet with rain or visiting in kimono or yukata. Kiyomizu-dera is an independent Buddhist temple in eastern Kyoto, which is listed as one of the 17 World Cultural Heritage sites in Kyoto. Priest Enchin is believed to have founded a small thatched-roofed hut to pray for Kannon Bodhisattva in the current precinct in 778. This temple, well-known for its main hall with a large veranda jutting out over the hillside, was originally built by Sakanoue Tamuramaro in 798 and rebuilt by the third Shogun Tokugawa Iemitsu in 1633. Speaking of temples in Kyoto, "Kiyomizudera" whose name always goes up. Selected as a World Cultural Heritage Site, Kiyomizu-dera Temple is a popular tourist attraction representing Kyoto, which is visited by many tourists from Japan and countries of the world. The area of the site is 130,000 square meters, and among the large site there are historic buildings such as the “Neonmon” and “Triple Tower”, which are imposing at the entrance of Kiyomizu Temple, and the most famous “Main Hall”. There are also nearly thirty. "Hondou" is a popular place known by the word "the stage of Shimizu", from which you can admire the view of the city of Kyoto. The word "jump off from the stage of Shimizu" is used in Japan in the sense of "to make a bold decision", but since it is the place that became the word origin of this word, it is from the actual "the stage of Shimizu" Please also look at the height. In addition, during the special visit period, a blue light called “light of mercy of Kannon” from Kiyomizu Temple is also emitted. The main temple of Kiyomizu-dera is a thousand-handed Kannon, and it is a hidden Buddha that is only opened once in 33 years. 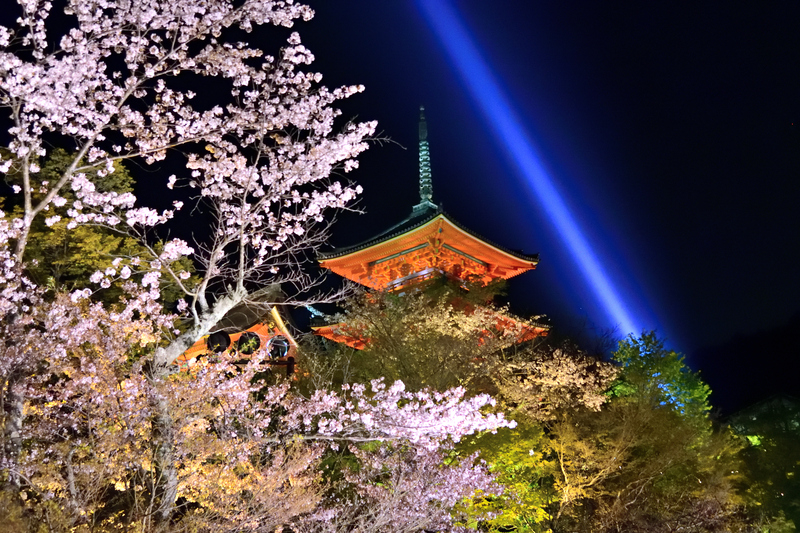 The night cherry blossoms light up of Kiyomizu-dera, where the gentle atmosphere of cherry blossoms and the mysterious and holy atmosphere are fused, you can feel the delicacy of Kyoto over other places of cherry blossoms. Finally, the renovation of Kiyomizudera has just left the main hall and the shakudo hall. The main roof began to be assembled with a roof from January 2017, and now the seat is covered and the appearance can not be seen. Completion will be the 2020 Olympics.